I am not the big football fan I used to be, or at least not a fan of what the environment surrounding the game has become. The reason for this is likely because I grew old enough to start paying attention to the business side of things, which seem to have become greedier and greedier as the years passed. The game has become, for a long time now, a circus for marketing everything from fast food, trucks/cars, booze, soft drinks, health insurance, pro-wear and the list could go on and on. Not to mention the ever growing arrogant and greedy attitude of the players--some who may be in court for drug dealing in the morning yet allowed to play the game by that same night. The game has also become a conduit to promote an anti-social Rap Music culture through many subtle and obvious tones in the commercials emphasizing on many of the products mentioned above. It has become a loud and ‘in-your-face’ obnoxious advertising campaign for national mega companies. Again, I know it has probably always been this way to some degree, and I am not romanticizing the past game, but things certainly have become obviously worse. Oh, let’s not forget….Somewhere there is actually a game in here--one where the athleticism of the players the audience watches is certainly not reflective of many of today’s fans. When I used to watch the game a lot, my friends and me wanted to be as strong, healthy and fast as the players we watched. That was our role model, not the player being a thug, all mouth and no action, or us becoming a bunch of fat guys on a couch staring into space at the TV while awaiting pizza delivery! At half time we played the game, these guys on the other hand cannot get off the couch unless food or the smell of a TNT level fart does it for them! Ok, you may think I have some opinion of today’s game and some of its fans, and all which surrounds it, but the fact is, I am still a fan of the game itself. Not one who watches every game of every team or one who bets on the games, but a fan of the Cleveland Browns. We really do have the best fans in all of football. We love them not because they’re good at any particular time, we love them because they’re just “our Browns” Corny, maybe, but this brings me to the part of this article I wanted to arrive, and that is, as the season approaches want to take some time to reflect on the game of the past. How many are quick to point out that the athletes were not as good, bla..bla..bla..But at the same time, no one mentions about the fact that the players of yesteryear did not have the luxury of the training of today’s game. Naturally, the game has evolved in this way. At the same time one could argue that players of yesterday were less pampered with sports medicine, less pampered by the officials, less pampered by padding, less pampered by the perfect playing surface and climate controlled facilities, etc… So, in the end, it is all relevant--a trade off, if you will. As for the health of the players, I can assure you this, most of them probably sat down to healthy home cooked meals, even while on the road, and rarely saw fast food because it simply did not exist as it does today. So , for overall health, I would say the player of the past was healthier in that respect and probably many other disciplinary aspects as well. The game was more pure in a sense not only from a physical stand point, but from a stand point that it was not the loud marketing machine it has become today with even many stadiums taking on the names of whomever has enough cash to flaunt to buy it. Speaking of “buy it“, players had more loyalty to the team, city, and fans, because the game was not as much a “I’ll play for the highest bidder” scenario! To a degree yeah, but nothing like today, and so all things considered, is it any wonder why I love watching old school, heavy hitting, down and dirty football films of the 50’s, 60’s, and early 70’s? I dedicate the following presentation below to all who share in this opinion. 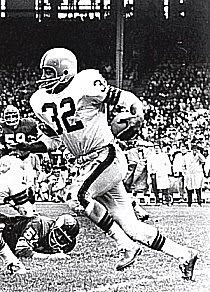 It is a highlight film of the 1968 Cleveland Browns. The heart and soul is evident because we really played for the love of the game more than the love of the money! This is classic!! Enjoy! Photo: The one and Only, Jim Brown!